Beechworth is a vibrant, lively place, and has been enriched by the contributions of people from many different cultures. The legacy of those pioneers is preserved in the many historic buildings and heritage streetscapes with their wide tree-lined avenues and shady wooden verandahs. 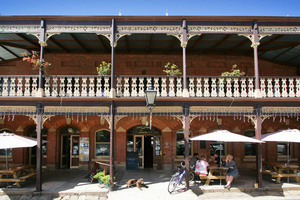 Today visitors can explore the town's opulent past by taking a leisurely and enjoyable self-guided walking tour of central Beechworth. An excellent detailed guide is available from the Visitor Information Centre. Today, Beechworth offers new riches for visitors to enjoy, with renowned regional cuisine, excellent cool climate wines and the ambience of great cafes and fine restaurants to suit all tastes and pockets. Shopping in Beechworth is also a memorable experience with antiques, collectibles, fine art, pottery, books, fashion boutiques, jewelers, home-wares and an array of other specialty shops crammed into town's commercial centre. 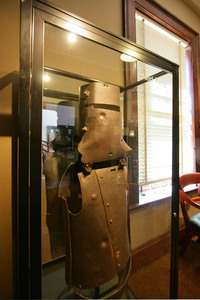 ï»¿Beechworth's proud claim is â€˜Victoriaâ€™s most historic townâ€™ Gold was first discovered in 1852 and, within months, some 8 000 diggers were working Spring and Reidâ€™s Creeks. The field was rich with over 18 000 ounces of gold leaving for Melbourne each fortnight. The population on the field was mixed and with a Chinese contingent outnumbering the Europeans 5 to 1 there was always tension. That tension flared in the nearby Buckland Valley when race riots took place on 4 July 1857.
ï»¿But it is the proud heritage of private and public buildings, mainly constructed in the 1860s, and the streetscapes of mature trees, parks and gardens that sets Beechworth apart. Thirty two of the townâ€™s buildings have a National Trust classification. The best way to enjoy the town is to leave the car and walk along Ford Street, beginning at Sydney Road. Turn right into Church Street, right into Last Street, right into Williams Street and left at Loch Street and back to Sydney Road. Powder Magazine (1859) Camp Street. ï»¿The Burning Towers at the Beechworth Cemetery testify to the presence of Chinese on the fields. On the townâ€™s outskirts, off Wodonga Road, are the Chinese Burning Towers. The twin ceremonial burning towers, flanking an altar, were used to burn offerings to the dead, to help them in their celestial realm. ï»¿The town is only one of the attractions of the area. The area is one of outstanding natural beauty with endless opportunities for lovers of the great outdoors to explore the trails and back roads. 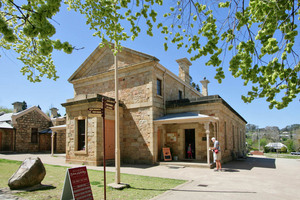 Beechworth Historic Park: The park was established in 1980 to protect the natural and man-made features of the area. The park occupies a number of sites; the Woolshed Falls, the Gorge, Lake Kerford, Two Mile Creek, Three Mile Creek, Flat Rock, Yack Rock and Telegraph Rock. At Woolshed Falls there is a self-guided historic walk and information leaflets are available at the start of the walk. Self-guided walk information is also provided for the Kerford Lake Walk. The 5km Gorge Scenic Drive begins opposite the junction of Wodonga Road and Sydney Road and is for one-way traffic only. A descriptive leaflet is also available at the start of the drive. For further information contact the Visitor Information Centre. You'll also discover of the Beechworth Gorge, Stanley State Forest and Chiltern Mt Pilot National Park. Mountain biking is an increasingly popular adventure activity with a dedicated mountain bike park offering a host of tracks to suit all levels of fitness and skill. And for cyclists seeking something slightly more sedate, the Beechworth to Everton branch of the famous Murray to Mountains Rail Trail offers an outstanding ride on a sealed path through the area's picturesque bush and farmland.